This beautifully designed and comprehensive compendium on Japanese food preservation is a culinary gem. 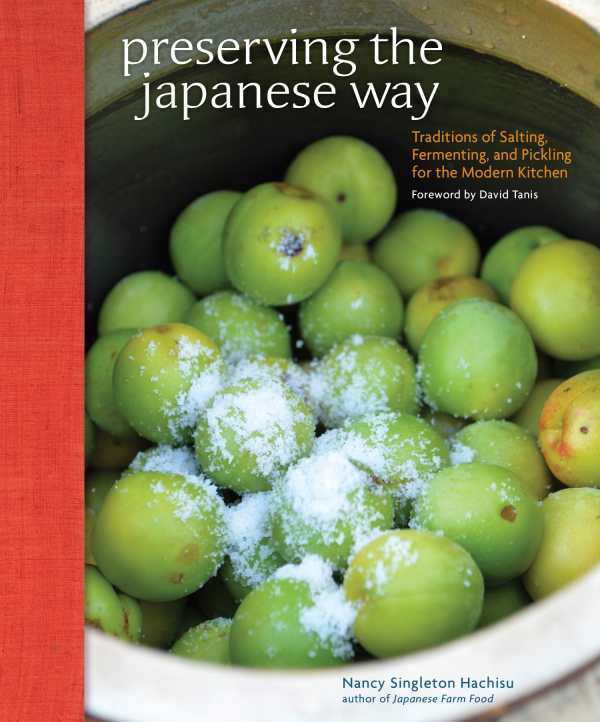 Nancy Singleton Hachisu enriches the literature of food preservation with her sparkling new compendium, Preserving the Japanese Way: Traditions of Salting, Fermenting, and Pickling for the Modern Kitchen. The California native draws on twenty-six years of living and raising a family on a rural Japanese farm, so she easily explains things to Western foodies who may be familiar with only the most popular Japanese preserved items, like tofu, soy sauce, and miso. Singleton Hachisu carefully layers the information about traditional Japanese ingredients, foodways, and cooking tools so that none of the 125 recipes seem too daunting. The book is organized by food types and preservation methods, starting with the use of salt, air, and wind to make quick pickles and longer-term cured foods. Advanced preservation techniques and unusual ingredients are deconstructed later, with a garland of photo essays about farmers, craftspeople and artisanal producers seasoning the blocks of culinary instruction. Singleton Hachisu is an active member of the Slow Food movement, and her passion for seasonal, top-quality ingredients and support for local producers is evident in her prose portraits of the makers of salt, charcoal, katsuobushi (smoked bonito), lacquer, and other wares. It is important documentation of some Japanese traditions that are on the wane, though she notes that many are thankfully being championed by new generations of farmers and crafters—and eaters—at present. Though the author meticulously documents traditional Japanese preservation methods and techniques, she is not averse to experimentation, and this, along with her refreshingly uncomplicated and vivid recipe instructions (as when she describes how to scrub rice before steaming: “this is a bit of a mash-and-knead operation”), gives home cooks the confidence to tackle a batch of homemade fish sauce, rice vinegar, salt-massaged salad, or even a flagon of sake. Japanese words are defined throughout the text and in the prefatory overview and rear glossary, for ease of use. This comprehensive resource is beautifully designed with handmade paper borders announcing each new chapter, over 350 artfully composed photographs by Kenji Miura, and pages that are laid open easily and encapsulate each recipe on a one- or two-page spread. Taken together, these features make Preserving the Japanese Way a true culinary gem.